Here's a fun postcard shot taken inside the ever-moody Park City Center Mall in the 1970s (back when it was still dark and moody). In this photo we see a small kiosk store in the middle of the mall proper, but I need a little help with this one's name. It obviously sells nuts, but it's a store I'm not familiar with at all, and the back of the postcard is no help. It appears the name is "Ah! Nuts", but I'm not positive (maybe that's reversed?). Any fellow mallrats (particularly those familiar with either Park City Center back in the day or this shop itself) know for sure what this store was called? Either way, it's a neat shot, where you can also see the very colorful Fifth Avenue Card Shop as well in the background. "We've all heard of Mego Store appearances to promote toy lines, many of us even have fond fond memories but few photographs remain. Enter Megomuseum member Doug Knoth with his amazing recently unearthed photos from a store appearance at a Korvette's in the Sunrise Mall, Masapequa NY around 1977 to promote the World's Greatest Superheroes as well as the Micronauts. Spider-Man and Acroyear pose (above) in the mall for children next to my parents patio furniture." See more Sunrise Mall here! See more MOA Galleria here! "The distinctive architecture of Southcenter is highlighted by the beautiful J.C. Penney store, largest in the Penney chain. Penneys is one of the four major department stores in Southcenter which along with 110 other stores makes it the largest shopping center in the Northwest and one of the largest in the world. The main building covers 30 acres of the total 116 acre site. The center is 8 minutes south of Seattle at Tukwila and the Junction of Interstates 5 and 405." Wonderful sixties postcard photo of children playing around the brightly-colored "Noah's Ark" fountain in an open-air court at The Landing mall (or shopping center, whichever you prefer) in Kansas City, Missouri. Stuff like this is what magical childhood mall memories are made of! "Found this photo while going through old pictures. It is a lovely shot of an indoor fountain in a two story mall. The whole family tried to remember what mall it was but we are coming up short. We live in Northern Ohio in the Cleveland area but it may have been taken on a vacation to Baltimore or to Washington DC. Would love to know if any of your readers can remember where it came from. 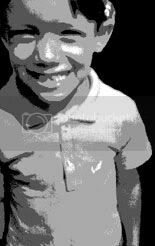 We know the photo was taken in either 1980 or 1981." (Excerpt) The enormous growth of the U.S. population has meant vast new markets in everything from baby carriages to washing machines and wrist watches. Will every retailer cash in on the bonanza? Not at all. The reason is that since 1940, almost half of the 28 million national population increase has taken place in residential suburban areas, anywhere from ten to 40 miles away from traditional big-city shopping centers. Thus, to win the new customers' dollars, merchants will have to follow the flight to the suburbs. In the ten years from 1940 to 1950, St. Louis' suburbs grew 48% while the city itself added only 6% to its population. In the same period, Philadelphia's suburbs expanded twice as fast, Boston's eight times as fast, as their already-crowded metropolitan districts. The numbers tell only part of the story. Suburbia offers not only more new customers but better customers. The very bold and distinctive looking entrance sign at the Lakewood Shopping Center (or just Lakewood Center) as seen in the 1950s. This photo find comes courtesy of Brian Neuroth. Thanks, Brian! This is a great sign design to study, where less (in this case anyway), is obviously more. In the early-1980s, a second floor was added and the mall extensively renovated from its original 1950s appearance. In the mid-1990s, the mall was branded as the 'Sharpstown Center.' In 1998, neighboring Westwood Mall with the area's Dillard's and Sears stores closed. National tenants have left Sharpstown Center in droves since the opening of First Colony Mall in nearby Sugar Land, and the mall is now nearly 25 percent vacant." (Excerpt) S.S. Kresge is a man as well as a variety store, and, at 97, he was recently called out of retirement to address the annual meeting of the chain that he forged. While stockholders applauded, old S.S. (for Sebastian Spering) got up and exhorted them to make Kresge "an outstanding five-and-ten-cent syndicate." That did not jibe with President Harry B. Cunningham's idea of his job, and he rose to his feet and said so. Smilingly, he reminded everyone that the nation's third largest variety chain (after F.W. Woolworth and W.T. Grant) has expanded far beyond its old dime-store stage and is, in fact, quite a different creature. This small semantic difference highlights a new philosophy that has set all the variety chains off on their biggest spree of change and expansion. Here's a vibrant color postcard photo of the Jordan Marsh store looming high in the distance, above and anchoring a portion of the venerable Sunrise Shopping Center (as it was originally known) complex, along with a sweeping view of the beautiful surrounding areas. This shot looks West towards the shopping center, from the Intracoastal Waterway seen in the foreground. In 1980 the Sunrise Shopping Center was fully enclosed, redeveloped and renamed The Galleria at Fort Lauderdale. I still prefer "Sunrise Shopping Center" myself, though. "Ala Moana Shopping Center - Pictured is a small portion of the fascinating array of fountains, trees, flowers, sculpture and art work found in this vast complex in Honolulu." (Excerpt) The site of the new Shops at Tanforan in San Bruno, Calif. was a retail developer's dream. Located five miles south of San Francisco, in an area where the average household income is $90,000, it housed an underused mall known as the Tanforan Shopping Center — a real fixer-upper. Nighttime in 1950s New York. And here's the posh and fashionable window display (complete with Mannequins) at the Lora Lee Dress Shop, just oozing charm and retro swank! Now called The Shops At Tanforan, the Tanforan Shopping Center (or Tanforan Park Mall) originally opened in 1971, and then was rebuilt and updated in 2003. Current anchors include Sears, Barnes & Noble, Target, and JCPenney. 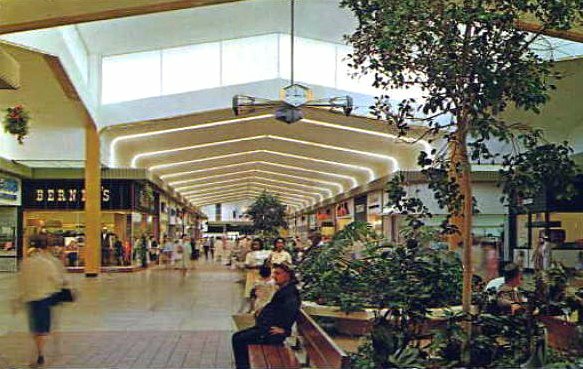 The vintage interior photo above is from one of the mall's 1970s postcards. "Tanforan mall is chic; beautifully designed and decorated. The architects, Altoon + Porter, are known for other famous mall renovations, including Las Vegas' The Fashion Show mall. The ceiling is stunning, with the latest in lighting design. At night, it glows a beautiful blue. Careful attention was given to detail, including fixtures and neutral flooring. The mall appears upscale and demands attention. Only Westfield Valley Fair Mall and Westfield Oakridge Mall could compare in terms of design." "Stonestown Galleria, originally Stonestown Shopping Center was built in 1952, by the Stoneson brothers. It was built in the Lake Merced neighborhood along with apartments that could house 3,000-3,500 people. The major tenant, the Emporium department store, opened on July 16, 1952. Other early businesses included Walgreens, Butler Brothers, Gallenkamp Shoes, the Red Chimney restaurant and Woolworth's. There were also stores for local residents, including a grocery store, a bakery, and movie theaters. The Stoneson brothers' development firm was also responsible for the later Stoneridge Shopping Center and Lakeside Village." Thanks for this image find goes (once again) to, Brian Neuroth, for spotting it in this great Flickr collection! The Daily Mall Reader: Vintage Shopping Malls Out Of Fashion? "More competition brings less hope for older, enclosed"
(Excerpt) Once-thriving malls across the nation are closing their doors, being demolished, or shutting down entire wings without any concrete plans for redevelopment. These malls, now considered dinosaurs in the retail industry, are battling for business against glitzier, more modern shopping centers, big box retailers, redeveloped main street shopping districts, discounters and entertainment centers. Traditional malls are undergoing changes of use to storage, university classrooms and new forms of retail. Recently, malls in Landover, MD, Ogden, UT, Muskegon, MI and Johnstown, PA have closed, a mall in Durham, NC is losing its anchor store, while a pair of regional malls in Toledo, OH and one in Oak Ridge, TN are treading water just to stay afloat. A declining mall in Spotsylvania, VA is hoping that the addition of a Costco will help revive the site. The Landover Mall in Landover, MD, once one of the region’s first and largest enclosed shopping malls, closed late May. Retro 1979 TV commercial for the popular New York-area Mays department store chain. From everything I've read, Mays sounds like it was a pretty cool department store with lots of colorful character. And I really dig their commercials and catchy jingle! "Every day's a sale day at Mays!" Best of all, this ad features the ubiquitous Proctor-Silex coffee makers, which were so common in the kitchen back when I was growing up in the 1970s (along with the very groovy Poly*Perks, of course)! A beautiful and sunny '60s view of the Downtown Shopping Park (or Main Street Shopping Park), at the heart of the historic (and pedestrian-friendly) downtown shopping district in Grand Junction, CO.